Before you bypass group fitness, learn how sweating with others can help you achieve your fitness goals. Are you new to working out/strength training? Is your progress or motivation flagging? Do you have signs of muscular imbalances? If you answered yes to even one of the above questions, you could be... totally normal! And someone who could benefit from a weekly group fitness class or two. As a certified personal trainer, group fitness instructor, and bikini competitor, I know the goal-hitting advantages of cross-training between lifting sessions. Sure that spin class isn't for you or that you'll never get hang of that Pilates reformer machine? That's OK. There are more options for classes than there are gym tanks in your closet, and some classes will meet your needs and fit your style more than others. If you set goals and are willing to give 100 percent effort, group classes can help you succeed faster and better than you might have thought possible. Check out the reasons how below. And no, you don't have to wear your leotard. When training at home, one daunting question of self-doubt has no doubt come into your head: "Am I doing this right?" Well, it's hard to know how good your squat is if you don't have a giant mirror and no one is there to check your form! Of course, you can always pay extra for a personal trainer, but group fitness classes can be very helpful—and the price is often included in most gym memberships. A good instructor watches all participants throughout the class to make sure their workout is safe and effective. The instructor should also have fitness training and a certification under their belt, and it's not a bad thing to ask them about it, either. With your instructor's guidance, and by watching their moves closely, you can often get a safer, more effective workout than you would on your own. With your instructor's guidance, and by watching their moves closely, you can often get a safer, more effective workout than you would on your own. Muscle imbalances can come about in many ways, from suffering an injury to simply having a more dominant side. Over time, muscular imbalances can create serious issues. Hamstring imbalances, for example, can cause tightness and pain in your lower back. Sometimes, working with machines or doing exercises that don't challenge muscles individually can exacerbate the problem by allowing the dominant side to, well, dominate. In a group-fitness setting, however, you won't use machines or sit in one position the whole time. The variety of motions and positions used in most fitness classes can help stretch and strengthen each muscle individually, leading to major overall improvements. The variety of motions and positions used in most fitness classes can help stretch and strengthen each muscle individually, leading to major overall improvements. Attending a group fitness class led by a qualified instructor is also very helpful for learning to feel how your body should move. We often take for granted our own ability to move around, but working out gets us moving in ways we otherwise wouldn't. Anything beyond the normal 9-5 office activities can start to get out of range for our muscle memory. If we're not careful, we may be bending, reaching, twisting, and picking up objects with form bad enough to eventually hurt ourselves—without even realizing it. Of course, no one wants to injure themselves while trying to improve their fitness, which is why structured group-fitness classes can be an advantage. Working out gets us moving in ways we otherwise wouldn't. It's said that your friends help shape who you are. And isn't it more motivating to get in shape when you're around people with the same goals? In group-fitness classes, you're automatically afforded the opportunity for socialization. 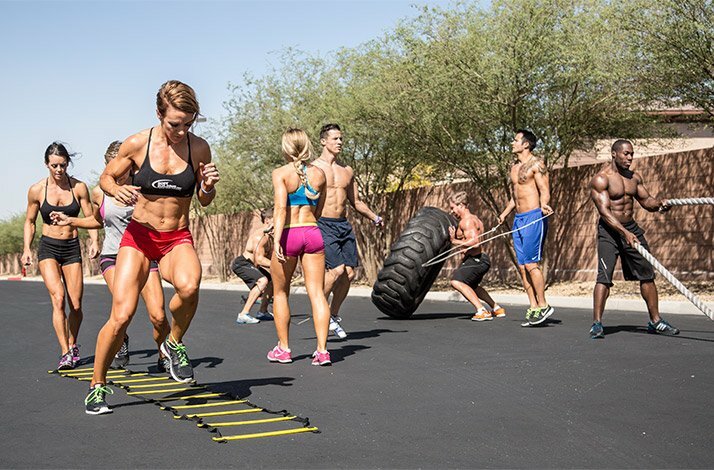 You're surrounded by like-minded people with similar fitness aspirations and interests. Chatting together before and after class—whether to share tips and tricks, highlight particular hurdles, or offer congrats on progress made—quickly builds a sense of community. This can be very motivational, and it can add to your reasons to keep coming back and making progress! Not only do you have the option to choose an entirely different genre of exercise on any given day, but each class also provides you with a different experience. While you might choose to attend a cycling class every Monday night, the instructor will usually try to keep you interested and working hard by changing up the routine. Going to a different instructor could add even more variety. Have more of a taste for strength training one day? Go to body pump instead of spinning your wheels at an RPM class. As a bonus, I find that it's much easier and more fun to get through an hour-long workout in a class setting than it is on your own! Instructors will try to keep the music and activities fun to keep the class energy levels pumped up. Not sure where to start when it comes to creating your perfect pairing of group-workout sessions? Decide on a target goal, and go from there. Decide on a target goal, and go from there. Classes that improve your blood circulation, heart strength, fat burning, and endurance through different levels of aerobic activity. Classes that involve bodyweight or free-weight exercises and can help improve a wide range of physical abilities. Classes that spend most of their time moving in a slow, controlled manner, and often use a mat. These help immensely with other kinds of training and with everyday life.